A year ago, I had just been informed that I was a finalist for GDS2. Five years ago, I had just finished the first round of GDS1. With a little perspective and a crazy year behind me, it seems like an appropriate time to kick off my new column: Unifying Theory. 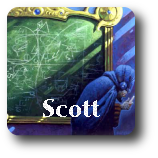 This column will attempt to distill my thoughts on Magic, design, games, and play into something informative and entertaining. I hope that at the very least the dozens of fans and supporters I picked up during the GDS enjoy what I have to say. I was originally going to make the next major group task a discussion about the strategies and sub-themes we should enable within and across colors, but Mr. Marques' article about our project prompted another idea that should be both fun and productive. He explained that the first thing R&D does when designing a new core set is to choose the reprints (which we've already mostly done informally) but the second thing is to brainstorm a mess of resonant top-down cards. Such is the genesis of recent core set homeruns like Reassembling Skeleton, Prized Unicorn and Ice Cage. We haven't really done that yet. 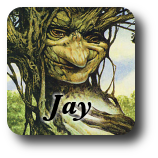 10/25/2011 - I am unsurprised to discover this card has already been done in some form in an Un- set. Unlike Mirror Mirror, I didn't want life totals to change because I was coming less from the mindset of "let us players change seats" and more from that of "let us planeswalkers swap bodies/minds." The original ability I thought of was "You exchange your library with target player's." That flirts with the prohibition against shuffling your opponent's cards into your library without technically crossing the line. What it doesn't accomplish, though, is keeping straight whose cards are whose everywhere else. Once I start playing cards from your library, we're going to have to remember which are yours and which are mine, particularly if our decks share any cards (like, idunno, islands) in common. Without sleeves or meticulous book-keeping, it could potentially be irreconcilable. Shared Fate has that problem. The solution? Trade all cards. 10/21/2011 - Today's Tom La Pille article makes Blood Addict the perfect card to share. Before I get into that, I want to touch on the most important point he wrote about: the fact that a trope like vampires has many different aspects and that any given card can only represent one or two of those aspects. Ruthless Cullblade, Night Revelers and Bloodcrazed Neonate show three different takes on vampiric bloodlust, while Sengir Vampire and Stromkirk Patrol show a couple different takes on growing stronger by feeding, Screeching Bat and Sengir Nosferatu show transformation and so on. This is a good thing. Even if you could fit all of a vampire's abilities onto one card, you'd be out of vampire designs instantly. More important than even keeping the card simple and preserving design space, it's actually really nice from a player's perspective to have a variety of different vampires to play with. It keeps things fresh and interesting even when you create a tribal deck. Thanks to the Magic multiverse, it's even satisfying to the Vorthos that vampires work differently on different planes. They work differently in each book and movie they appear in, so it's great that Zendikar gets one strain while Innistrad gets another. 10/20/2011 - Cellar Door is based off a fun horror trope, guessing what horror lurks within the darkness of your basement, in your closet or under your bed. The card plays a strong role in the blue self-milling Zombie deck and the thematic connection isn't bad, but it's far from the best in the set. It kinda changes the suspense from what-twisted-horror-is-on-the-other-side to how-many-zombies-are-down-there-and-how-often-will-they-climb-up. 10/17/2011 - What doesn't kill you, makes you stronger. Especially when you're green. I had the idea, "counter each spell targeting your creatures and put a +1/+1 counter on them instead." The simpler implementation is pretty powerful, so I stuck it on a small legendary creature so that it's at least vulnerable to creature combat, Pyroclasm and wrath effects. When Overrun was revealed to be an uncommon in Magic 2012, a lot of people cried foul, complaining that the card is too powerful for limited. After a couple weeks on Magic Online, Lee Sharpe shared stats illustrating how many matches were won by players who had drafted various cards and Overrun was not at the top of the list, not even for uncommons. What was? Mind Control. Overrun will absolutely win you a game if you can set up for it by playing lots of creatures, avoiding trades and not getting fogged. In contrast, Mind Control is at its best in every situation except when you're already winning (because your opponent has no creatures). 10/13/2011 - Remember Mishra's Bauble? Street Wraith? Spikes know that a smaller deck is more consistent and that consistency is a powerful tool. I was thinking about the one-mana cantrips (Peek, Ponder, Preordain, Clairvoyance, Opt, Visions of Beyond) that approximate this deck-thinning technique. Each replaces the cards it took to cast it and then offers some other nice little bonus. Could we have a bonus of being free? Gitaxian Probe does this at the cost of 2 life, but can we make it totally free? It can't just cost 0 or every deck of every color will always play it. If we leverage the Submerge method, we can associate it to blue decks by making sure you control an Island, but what's the flavor there? What do blue decks commonly have—other than Islands—that could support something like this? 10/12/2011 - The only two questions in mind about this card are: Should it require a tap to activate; And should the aura deal the damage or the creature (using its power)? I'm thinking the way you see it is likely best. Metaghost added Sunblessed Tactician to the card file pretty early on as less consistent alternative to Blinding Mage. It originally triggered on white spells, but Wobbles suggested triggering on plains to match the caring-about-land-type theme Lair had already introduced. It's been a bit of a favorite ever since, with the only complaint being that its ability is purely offensive in nature, since you normally can't activate on your opponent's turn. 10/10/2011 - Cards like Squadron Hawk and the slightly less impressive Llanowar Sentinel are interesting. It's not just the card advantage, but the fact that they interact with an aspect of deck-building that most cards don't. Each instance of these cards cares how many more copies you have in your deck. Legends do too, but these wacky cards reward you for having more of them rather than punishing you for having too many. How else can we play with this concept? 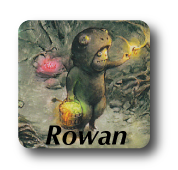 Hey all, my name is Rowan, aka uber_pochacco on Twitter, aka unbrokencircle from way back when on the GDS2 wiki. During GDS2, I helped the contestants by spending a lot of time looking at old cards, both individually and on a set-by-set basis, in order to learn more about Magic design. That information was invaluable in creating sets of commons that looked like they could have come from an actual Magic set. But that sort of analysis is also useful in analyzing new sets and uncovering specific design decisions that were made which aren't always obvious at first glance. As Mark Rosewater said during the GDS2, one of the best ways to learn about Magic design philosophy is to look at current Magic sets. Today I'll be using this technique to look at how White in Innistrad compares to other sets and why. 10/7/2011 - I haven't done a CCDD in a while because I've been busy with the M13 project, but that hasn't stopped interesting new ideas from presenting themselves to me. In an odd moment of having a little spare time, I'd like to share one with you. While the other designers have been exploring different Lair-design rules to rewrite, I've been looking into the possibility of expanding upon or replacing the existing static abilities with enters-the-battlefield abilities. The reason we've only used static abilities so far is that a big part of what makes Lair as good/fun as it is (and as new-player-friendly) is that you can turn it on after you've played your Lair card. ETB effects require the land to already be in play to do anything. We know it's reasonable to do because of Parasitic Strix, Rhox Meditant and Sedraxis Alchemist, but that doesn't mean it's optimal for Lair or M13. Since this project is a learning exercise, it makes more sense to test that hypothesis than to trust it, so I made some cards and shuffled them up to see what's what. While the designers continue to test alternatives to the current Lair paradigm, I wanted to keep some content/discussion flowing. We've had a functional reprint of Kinsbaile Balloonist in the file as a white common since nearly the beginning. That inspired a similar card for vigilance which is fairly cute and plenty appropriate for white, but makes me wonder if we couldn't make a full cycle. Maybe blue gets Chasm Drake, white gets Elephant Rider, black gets a horror that grants Intimidate, red gets a hound that grants haste and green gets a beast that grants trample.